Continuing on with our recent geological theme here at Pyroclastic Pixels (you’d almost think I was a geology grad student or something…), today we are going to take a look at one of the most picturesque geological curiosities you’ll ever find: honeycomb weathering, also frequently referred to as “tafoni”. Those two terms aren’t really exactly quite completely equivalent but we’re not going to journey down the nit-picky fork in the road today. Honeycomb weathering is pretty cool. About the only thing that would make it better is if the holes were actually filled with honey. That joke sounded way better in my head than it looks on the screen. Specific geographic and geologic conditions are needed for honeycomb weathering to develop, yet these conditions can be satisfied in a variety of places, from the arid deserts of the American Southwest, to the storm-battered shores of the Pacific Ocean. Here in northwestern Washington State, honeycomb weathering occurs along the coast, along and just above the high tide mark, in areas where a rock unit known as the Chuckanut Formation is present. The pictures on this page were taken at Teddy Bear Cove, just south of Bellingham, WA, which has some of the most spectacular examples I’ve ever seen. The Chuckanut Formation, or “the Nut” as I like to call it when I’m feeling lazy, is a thick series of sandstones, conglomerates, and occasional coal seams that were deposited about 60 million years ago when NW Washington occupied a large basin at the foot of an ancient mountain range that occupied more or less the same space that the Modern Cascades now occupy. There is a good reason that sandstone is one of the rock types most susceptible to this type of weathering. Sandstone is essentially composed of countless tiny, sand-sized particles of various minerals (mostly quartz and feldspar in the case of “the Nut”) which are held together by some sort of substance, known as cement, that “glues” them all together into a solid mass. In most sandstones, this substance is either calcium carbonate (CaCO3) or silica dioxide (SiO2), also known as quartz. Honeycomb weathering forms when salt-laden sea spray lands on the sandstone. As the salty sea water evaporates, tiny salt crystals form on the surface of the rock. The growth of these salt crystals on the surface of the rock physically separates the sand particles from the cement. Over time (a long time…), this creates a small depression in the rock. Once a small indentation forms, a positive feedback effect is created; the hole has a greater surface area than a flat surface and thus more rock is exposed to incoming sea spray. Sand grains are thus separated from the cement at a faster rate, thereby enlarging the hole. In some locations, you can actually see little piles of sand grains in the cavities, grains that were once part of the rock but have now been forcibly removed by the salt. I’ve found that this is most prevalent in areas just above the high tide line where wave action can’t wash the sand grains back out to sea. But Zach, you say…how then does honeycomb weathering form in places like the desert Southwest where the closest thing to sea spray you’re going to find is mule deer pee? Ah…well I’m glad you asked. 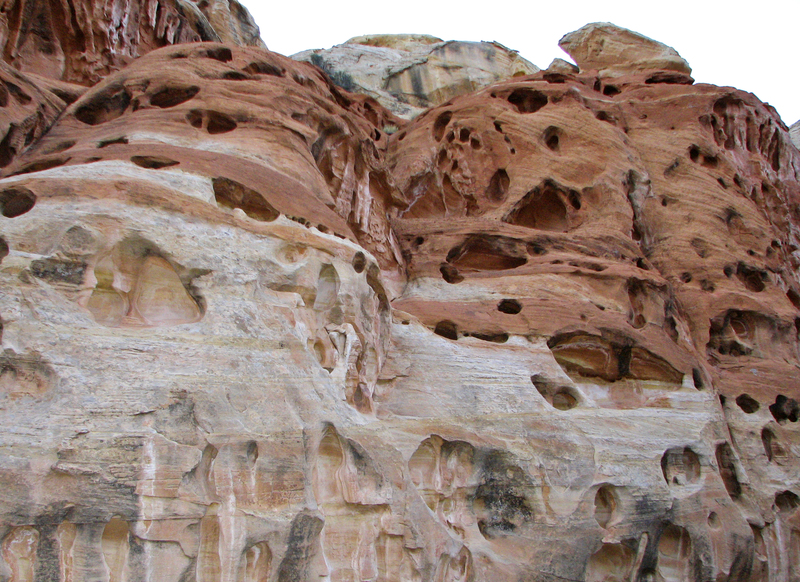 We often observe honeycomb weathering in sandstone in places such as Southern Utah that are far away from the sea. I had some difficulty finding a halfway decent picture of desert honeycomb weathering from my archives, but I was able to find one that I took in 2008 in Capitol Reef National Park (see below). If you want to see a lot better examples, just do a Google image search for “Utah tafoni”. While the exact cause may vary, and the individual pits tend to be larger, the process involved is essentially the same. We still need to find some way to separate our sand grains from the cement. Many washes in the southwest are dry for most of the year but are very rich in dissolved salts when they do flood. In desert environments, it’s no surprise then that we tend to find honeycomb weathering predominantly along dry stream beds and canyons. When a flood comes through, even though the water may not be as saline as the ocean, it is still salty enough to form small salt crystals when it evaporates, which it invariably does. In other locations, slightly acidic groundwater percolating through rocks can actually chemically dissolve calcium carbonate cement, leaving the sand grains with nothing to cling to. This entry was posted on January 11, 2013 by Zach Schierl. It was filed under Bellingham, Geology, Ocean, Washington and was tagged with bellingham, chuckanut, desert, geology, honeycomb, salt, sandstone, tafoni, teddy bear cove, weathering. Zach, please tell me why the growth of the salt crystals physically separates the sand from the cement?! In terms I can understand without having to read the scientific article 🙂 Also, would I be able to observe any honeycomb weathering on the beaches where I live? Good question! The papers I’ve read don’t offer a real detailed description of the process, but they way I understand it is that salt water seeps into the pore spaces in the rock, and then upon evaporation the growth of the salt crystals in a confined space causes the grains to dis-aggregate. Hope that clarifies things a bit!